In the quest for sharpness, focusing is a crucial parameter. For a long time, on most simple cameras, focusing had to be done by guessing the distance to the subject. With large format cameras, focusing was made on a ground glass which took the place of the film. Rangefinder cameras allowed to focus easily and accurately. Rangefinders work on a simple principle : when an object is observed from two separate points of view, the two lines of sight make an angle. By measuring this angle and the distance between the two viewpoints one can determine the distance to the subject. A photographic rangefinder makes this measure quite easy : two windows take two images of the subject which have to be superposed by turning a knob. The distance is then automatically given. On the first rangefinder cameras, the rangefinder was independent from the lens and from the viewfinder : one had to read the distance, dial it on the lens and then compose the picture. Viewfinder and rangefinder were then put togeher so that it became possible to focus and compose the picture at the same time. Accordingly the rangefinder was coupled to the lens. 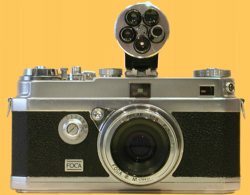 For cameras without focusing aid, separate rangefinders were available like the Watameter II on the right which can be seen mounted on a Kodak Retinette. Rangefinders are very quiet : unlike reflex cameras, there is no need to flip a mirror to take the picture. Its downsides are the parallax between the finder and the lens (corrected on high-end cameras) and the ineffectiveness of the rangefinder with long lenses.